Magnet is by no means the first macOS app to bring this Windows feature to the Mac. In fact, it’s not even the first such app that I’ve bought. However, it is the first one I’ve found I can actually live with on a day-to-day basis. All the others were cool for a few days, and then ended up in the eternal bit-bucket in the sky because they made me cranky in some way. Most of my past crankiness with similar apps stems from the fact that I’m a big user of macOS’s spaces feature, which gives you multiple desktops. That means that banging a window against the edge of the screen already does something on my macs – it moves the window from the current space to an adjacent one. I want the ability to lay out my windows, but I don’t want that functionality to be tied to hot-zones at the edges of my screen. Magnet is the first window tiling app I’ve tried that caters for users like me. 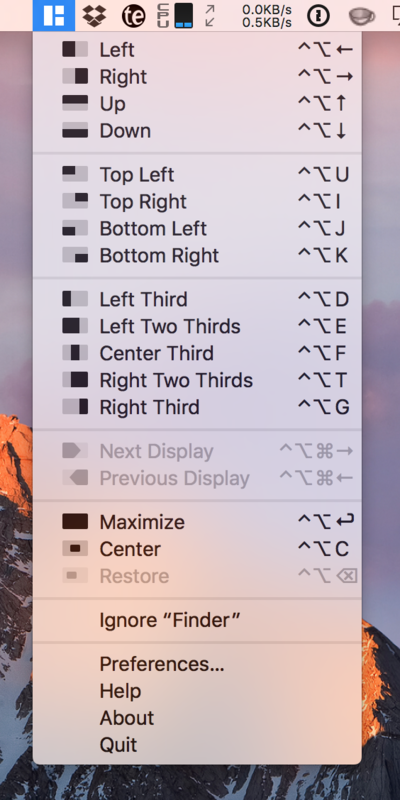 The reason Magnet works for spaces lovers is that it’s designed to be triggered in three different ways – from the menubar icon, by keyboard shortcuts, and, by banging windows off the edges of the screen (or snap by dragging in the app’s lingo). And, more importantly, you can edit or even disable some or all of the keyboard shortcuts, and there is a switch to disable the snapping behaviour. If you’re a spaces user, just un-tick a single checkbox and you have a window tiler that is completely compatible with spaces! Similarly, if any of the pre-assigned keyboard shortcuts don’t make sense to you, or, get in they way of some other custom keyboard shortcut you’ve added to your system, no-problem, you can disable or replace any or all of them. I also mentioned that Magnet takes things further than the standard window snapping feature in Windows – it doesn’t just support half screen and quarter screen windows, but also proper full-screen windows (why on earth Apple never implemented this properly in macOS is beyond me), and horizontal and vertical thirds, and even two-thirds. When half and half is not a good fit, two-thirds and one-third often is. 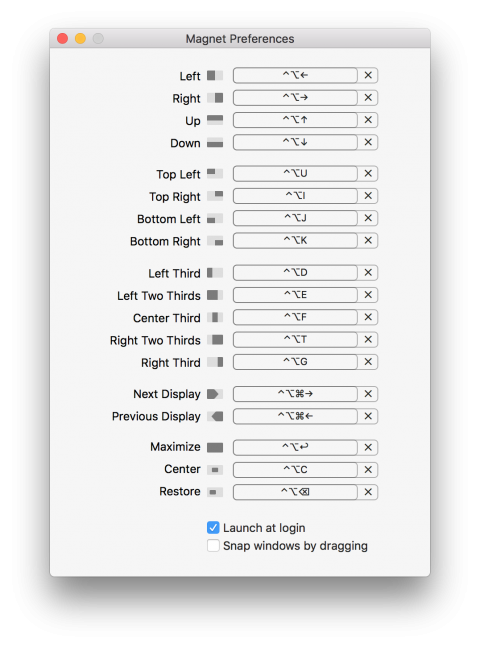 Any window that has had its sizing and/or location altered using Magnet can also be restored to its original size and position from the menubar, or, via a configurable keystroke. The screenshot below shows the menu Magnet adds you menubar. It shows all the positioning options Magnet provides nicely. In my experience, when you have acres of screen real-estate, an app for managing that real-estate doesn’t add much value, but when screen real-estate is a limited commodity, managing it quickly and easily becomes invaluable. For that reason, I have Magnet installed on both of my laptops (pre-retina 13″ MacBook Pro & 12″ retina MacBook) and have come to love it and depend on it, but I don’t bother with it on either of my desktops (27″ iMacs).